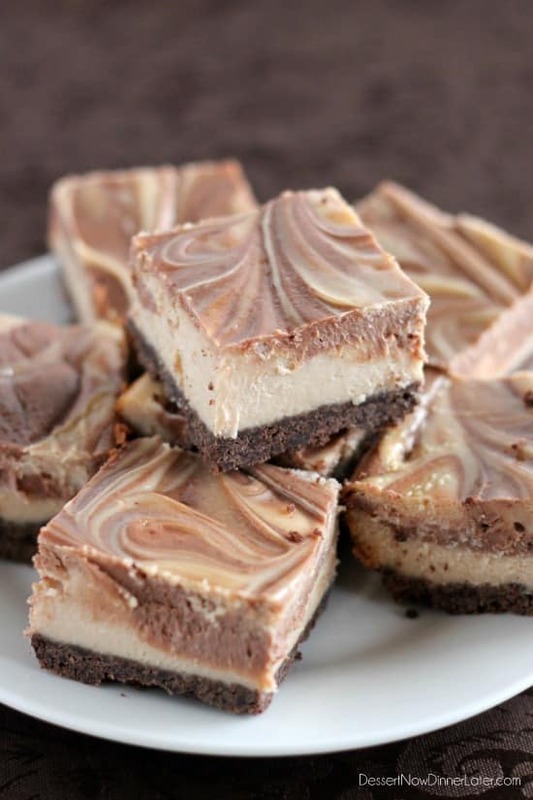 Peanut Butter Chocolate Swirl Cheesecake Bars - Dessert Now, Dinner Later! It’s been a while since I have made cheesecake anything. I had a couple packages of cream cheese about to expire so I wanted to use them up and I had a good idea of what I wanted to do with them. Peanut butter and chocolate is one of those combos that just go well together. It’s a match made in heaven and it certainly rings true in today’s dessert! 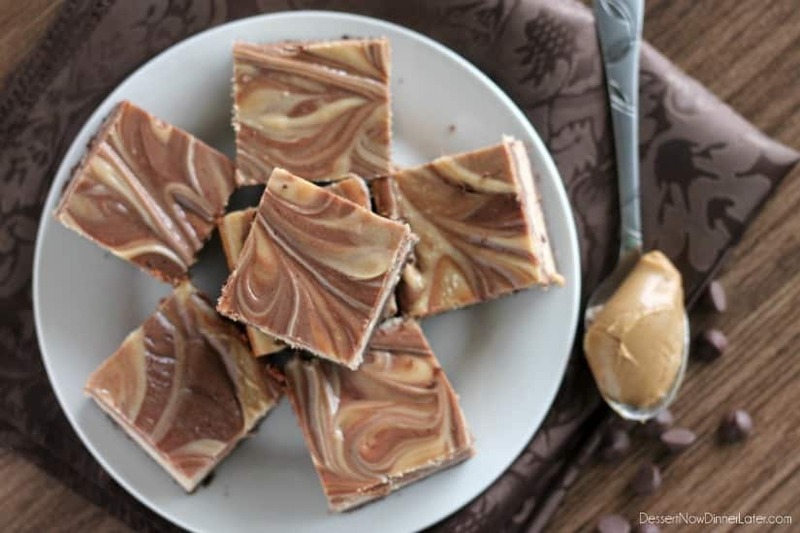 Peanut Butter Chocolate Swirl Cheesecake bars are so pretty and fairly simple to make. I love using my food processor to blend the cream cheese perfectly smooth. Plus, I had all the ingredients on hand in my house, but I also stock up on chocolate chips during the holidays so I have them all year round for super cheap. My kids eat graham crackers (chocolate and honey flavored) all the time, so that was nice to have on hand, and I am a peanut butter freak too! I have peanut butter toast with my smoothie every morning for breakfast. Delicious! So it was kind of a no brainer to have made this flavor. I also really liked that I made these into bars. 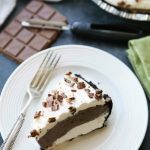 Don’t get me wrong, I love a big fat slice of cheesecake, but you still get 16 servings with this recipe. A small square is truly decadent enough that you don’t need more than that to satisfy your sweet tooth anyway. 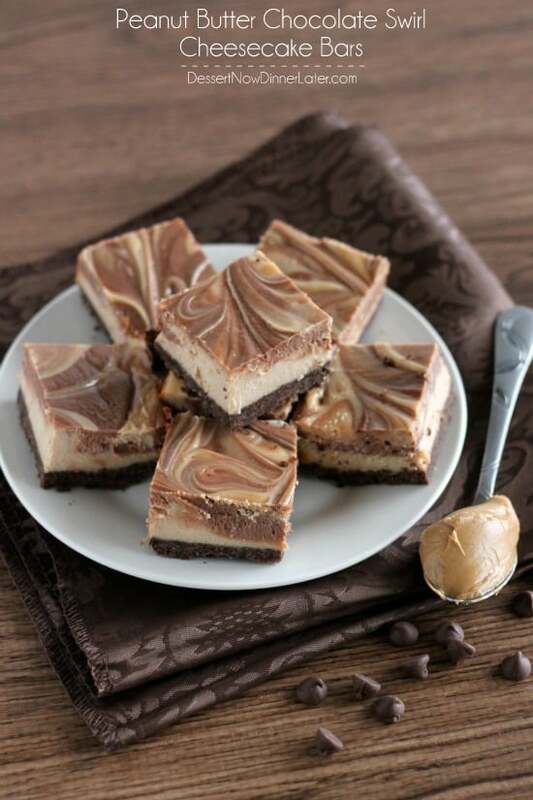 Are you ready to make some peanut butter chocolate swirl cheesecake bars? Let’s do it! In a food processor, pulse graham crackers until you get fine crumbs. Place crumbs in an 8x8-inch or 9x9-inch square baking dish. Melt butter and add it to the baking dish with the graham cracker crumbs. Mix together until all the crumbs are wet and press firmly onto the bottom of the dish. Bake at 350 degrees Fahrenheit for 12 to 15 minutes or until set and the edges are crisp. In a food processor, blend cream cheese and sugar until smooth. Scrape bowl, then blend in eggs one at a time. Add sour cream and vanilla. Blend until incorporated. Remove 1 cup of the cheesecake batter into a separate bowl. 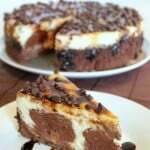 Melt chocolate chips and add it to the 1 cup of cheesecake batter. Whisk until smooth and chocolate is incorporated. Set aside. Add the peanut butter to the remaining cheesecake batter, still in the food processor bowl. Blend until smooth. 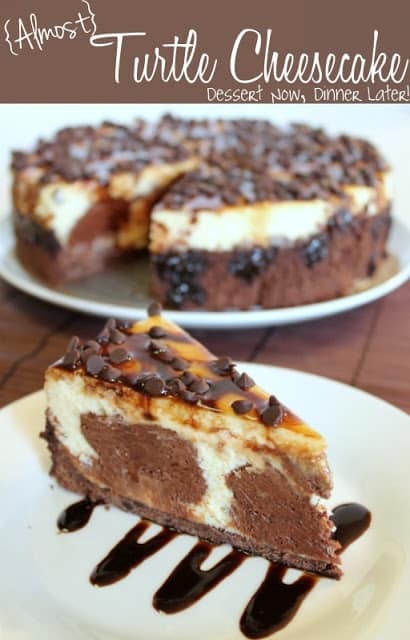 Spread half of the peanut butter cheesecake batter over the top of the cooked chocolate crust. 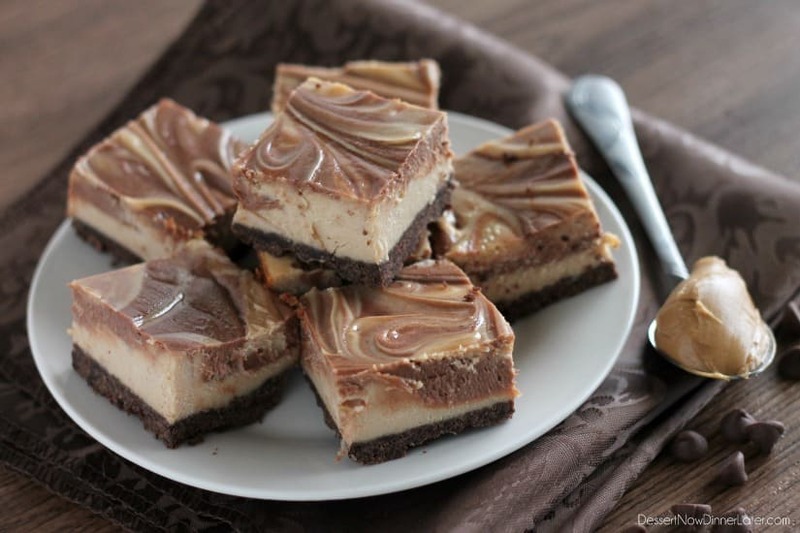 Dollop the chocolate cheesecake batter and remaining peanut butter cheesecake batter over the peanut butter layer. Swirl with a knife until you achieve a desired marbled look. Tap the bottom of the pan against the counter to help the cheesecake batters settle. 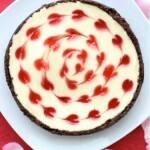 Remove cheesecake from oven and allow to cool at room temperature for a couple of hours. Then lightly cover the pan with a lid or plastic wrap and refrigerate the cheesecake 4 hours to overnight. Keep refrigerated. Cut squares with a hot knife when ready to serve. These bars look fantastic! Especially that swirl! 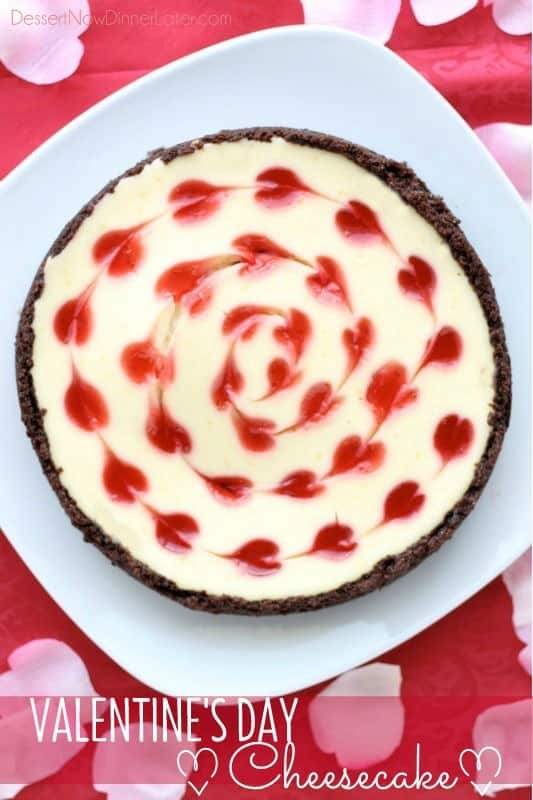 I love swirled desserts, so this was fun to make! Wow! These are SO pretty and look so delicious! Thanks Becky! It was so good! Oh my gosh, it’s a good thing these are not at my house right now, because I would eat them for breakfast! Yum! Haha…hey, sometimes I have dessert for breakfast, it’s all good! Mmm these look absolutely amazing. 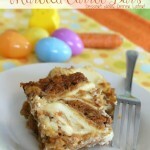 I too love cheesecake bars, cause the recipe just seems so much more approachable! I love you and hate you at the same time. You’re killing me Smallz! Yum!!! Well, being the runner that you are, you could eat the whole pan of this and not gain an ounce! 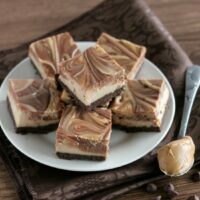 Peanut butter AND chocolate AND cheesecake!? I die. Wow those look exceptionally good. Thank you! They were incredibly delicious!